Rum-sugar is an excellent little helper characterized by the enticing scent of rum. It can be used as a replacement for cakes, desserts and tea. 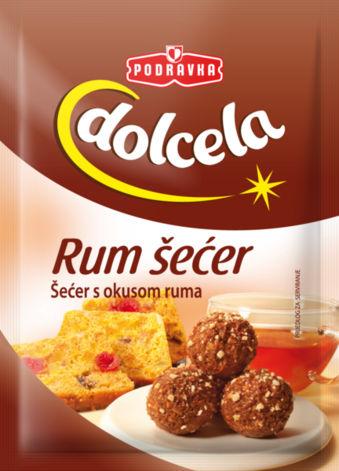 Contains only sugar and rum aroma and can be used as a replacement for rum in cakes. Can be consumed by children because it is alcohol free. No worries - rum-sugar will not make you blush! Application: For enriching the flavour of pastries, stuffings, beverages, fruit salads, cake creams and deserts. Three packets of rum flavoured sugar diluted in 100 ml water replaces 100 ml rum. One packet of rum flavoured sugar is sufficient for 200 ml tea. Product ingredients: sugar, aroma (contains wheat). Storage: Keep in a dry and cool place!